However, full and half marathon is a high school student and over 16 years old, 10km Run is a junior high school student and over 13 years old. *One set will be distributed to each group for 3km Family category. 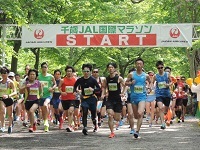 ○"Pair trip HAWAI 5days " organized by JAL pack" as Special prize will be given to ONE runner from both finishers of Full marathon and Half marathon who will participate lottery event that will be held at 15:00 on the event day. The 38th placed runner from full marathon(One person from male or female category) will be invited Shimada-Oigawa marathon. ○If the last two number in your number card is "39",your will receive an original T-shirt as Lucky Awards. 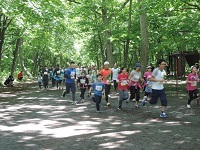 ○Over 80 years runners will receive the memorial prize. ●After event, the names and records of all the finishers will be posted in "Doshin Sports" newspaper.Purchase of "Doshin Sports" newspaper is available online. *The date of the post is subject to be changed. ●There will be a free shuttle bus running round trip from the event grounds (near the Chitose City library) to JR Chitose Station and the factory parking lot at the Kirin Building Chitose, Hokkaidou (capacity: approximately 1000 cars). ●Before the start of the 9:30 half marathon, we’ve frequently seen 3 km runners taking up positions near the start line in order to secure front positions for their race. It’s very dangerous if you get caught in the crowd at the start of the marathon, so we ask that you please wait at the location indicated by the officials on site until 10 minutes before the race. Also, make sure to follow the instruction of the staff to move to the starting area 10 minutes before the start.